Last month, I mentioned that a person will obtain copyright protection in a piece of art/work once it is put into a fixed medium. However, it would be a disservice to let the conversation end there, because there is much more to copyrights than just that. Although to be clear, the information here is by no means exhaustive. What is a copyright? Copyright laws are federal laws that afford protection for original works of authorship that have been fixed in a tangible medium of expression. 1. You cannot actually sue in federal court for copyright infringement without having first tried to register your work. (You need a certificate of registration or rejection of an application). Yes, you can do this after copyright infringement has occurred. But then you would have to deal with that while also dealing with a potential lawsuit, not to mention missing out on all of the additional benefits below. 2. 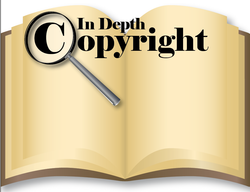 If it is registered within the first three months of publication or before infringement has occurred, the copyright holder can seek statutory damages and attorney fees to be paid by the other party. Statutory damages are very different than a regular monetary award in a lawsuit. Statutory damages are the amount that is dictated by the law (the payout can be anywhere from $750 up to $150,000 per copyright infringement depending on how willful the infringement is). This is instead of the court determining (through calculations) what your actual degree of harm was and what the defendants’ profits were. Attorney fees can rack up when you have to go to court and fight an infringement case; for many people, it almost makes it cost-prohibitive to even enact a lawsuit. So to be able to seek attorney fees to be paid by the other party is huge. 3. Registration puts the public “on notice” that your work is copyrighted by making it available on copyright search catalogs. 4. This “notice” also helps meet the legal burden of proof for ownership if registered within five years from publication. The typical filing fee is only $35.00, and many copyright claims can be filed online at www.copyright.gov/eco. Disclaimer: This is for informational purposes only and not exhaustive of all aspects of the law on this topic. It is not to be considered legal advice on any particular set of facts or circumstances. You should contact an attorney for advice on specific legal problems.